There’s no question that Alex Rios was public enemy number one at last night’s Home Opener. While some jeering was expected, I couldn’t believe the magnitude of boos that rained upon the former Blue Jay. Wasn’t it just nine months ago that Alex Rios was the future of this franchise? How quickly people forget when the player suddenly gets shipped off to another team. It’s not like Alex Rios ever requested a trade out of Toronto. It’s not like he ever had anything bad to say about the city or it’s fans (aside from the “Who Gives A F*ck” incident). So why all the hate for Alex Rios? Honestly, I’ve never heard crowds at the Rogers Centre booing that loudly for an opposing player … and that includes Alex Rodriguez. A-Rod did something that warranted being booed. His bush league move back in 2007 combined with allegations of cheating on his wife in Toronto were enough to get him booed. Alex Rios on the other hand, did nothing wrong other than suiting up for the other team. In the end it all didn’t matter anyway. Rios must’ve fed of the hatred from the crowd, because he went 3 for 5 and subsequently bumped his average above the Mendoza Line. Maybe in some strange way, I was secretly responsible for Rios’ great night at the plate since I was hoarding an Alex Rios t-shirt underneath my Blue Jays jersey. Good thing I didn’t decide to stand up and profess my admiration for Rios, because I probably would have been fed to the drunken wolves. I could not agree more about the debate surrounding all the hate for Alex Rios. I myself even listened to the majority of my Twitter 'friends' (who are mostly Jays fans) boo him as well. I wore my Rios Jersey with pride (nonetheless, I was in the confines of my home). When he got traded I was upset – he in fact, as you say, could have bcome the future of the Jays. I understand he had a big contract with a lot of money – but giving him away for nothing? I blame J.P for that one. That being the case, him being traded wasn't his fault. It's not that he left there and blamed Toronto for his poor career. In fact, in an interview that I watched extensively, from the day news was confirmed he seemed distraught and upset. He knows that his career until that point was in Toronto. That being the case I was in complete shock to hear (from my TV unfortunately) all of the boos that arose when he came up to the plate. If you figure out what he did wrong, please let me know. He was a good player for the Jays, had a great arm, and did have a few good years. So perhaps he wasn't a clutch player… is that a reason to boo him? Anyways, sorry for the rant. Great post. I'll be cheering tonight as others are booing, please wear your jersey with pride tonight. I'm doing so in spirit. Thanks for the comment, April! Nice to hear from a fellow Alex Rios supporter. Sadly, I still have a Rios figurine and bobblehead that I display in my collection. You hit the nail on the head with your comments. I was at the game, and it was the loudest I've ever heard the fans boo a player. I think he expected to get heckled, but not nearly to the extent of what it was last night. What it think it was, is one drunken idiot starts booing, then everyone else joins in. There won't be nearly as many boo birds out there tonight. Maybe you guys will take comfort in the fact that I clapped as loud as possible every time Rios came up last night. There were a few other Rios supporters in my section but we were vastly outnumbered and drowned out by all the boos. I'm happy to report the drunken wolves allowed me to cheer in peace. I suspect they were either too drunk or too preoccupied building massive paper airplanes to bother me. Kudos for cheering on Rios – it takes guts to do that when it seemed like the entire stadium was booing him. Luckily, we didn't have to worry too much about the paper airplanes from where I was sitting, but I can imagine the fans in the upper decks were probably so hellbent in throwing those things that they forgot there was even a game going on. It always baffles me at who Toronto fans will boo (and boo they did for Alex; Vince Carter and Daniel Alfredsson may be the only athletes to hear them louder). Although, I guess when the alcohol is flowing into the mouths of 45,000+ sorta-fans, there's bound to be some misdirected hatred. The one that always got me was Eric Hinske. I was a HUGE Hinske fan, and defended him to the last every time the crowd inexplicably booed him. I had considered wearing my Rios jersey to the game, but was afraid it might spark him to have an excellent game. Of course, it seems the booing did that anyway. Mike, I totally forgot about Hinske. He's probably up there in terms of negative reactions from the crowd at the Rogers Centre. Luckily, there aren't any interleague games against the Braves in Toronto this year. 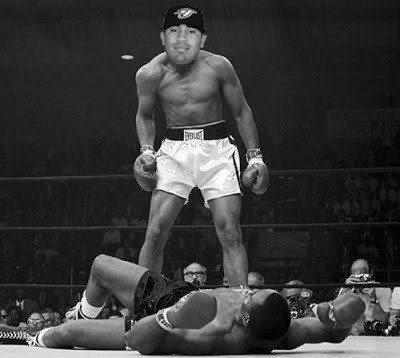 Rios has been feeding off the crowd – I think Toronto is his official slump buster.